Second story of the "Vampire's Heart" short series. It's about vampires and fallen angels. The second part of the title is translated as it follows: Non omnis moriar (latin proverb) - I shall not completely die. In the story you see how Aldorniya loses her immortality and how Avon is turned into a vampire. "We are almost there", she said and then suddenly he was upon the spell of her presence no longer. He looked around and breathed in deeply at the sight of the impressive Gothic castle that rose above them, just in the middle of the dark nowhere. He heard the squawking of the ravens perched on the fence, and he got cold chills all over his body, but nevertheless he had the strange feeling that these creepy birds would be the least of his problems. "And now what?" he asked when they landed and she left him on the cold rocky ground. "Follow me and keep quiet." They came near the big greatly ornamented gate and when it opened a big and majestic vampire-angel, the most wonderful creature Avon could ever imagine, crossed their way. His wings were a few times bigger than Aldorniya's, and his long shiny black hair was falling freely on his broad and strong hands. He was wearing nothing but his leather pants but he looked dangerous even without a weapon. The second being created to kill that Avon saw that day. "What are you doing?" the voice of the keeper of the gate sounded furious. "Aldorniya, have you lost your mind? It's forbidden to bring mortals here, you know the rules! How dare you bring a human in His castle?" "Maybe I should have let him walk around freely and tell everyone of his kind about my existence? It seems that it's not me who have lost their mind, Eamon" she answered with a streak of irony. Avon couldn't accuse her of lack of courage - she seemed so small and delicate but it didn't stop her from standing impassively in front of the huge angry giant and even to make ironic remarks. "As if someone would believe him..." he shrugged his shoulders and pierced the scared man with a gaze full of disdain. "Well, now it's already too late for regrets. I am sure you will be punished for your actions soon. You can go inside and meet Him." "Your human, however, must stay in the garden. This is my last word", and if his warning wasn't enough convincing, his angry and threatening expression certainly was. Aldorniya hold Avon's hand and took him inside the garden. "Stay here until I come back. Whatever you see, whatever you hear, do not cross the fence. The creatures, which might be seen outside, are dangerous." "More dangerous than you? ", his smile was sad. "Don't worry, I have nowhere to go... I can't even fly. I am just a mortal in the world of the godlike." She turned his back to him and went into the dark castle. She flew through a great number of corridors and staircases, greeting some of her kind during the long way. Finally when she reached the enormous Hall of mirrors, she heard His voice from the inside. "Come in, Aldorniya. I was expecting you." Aldorniya opened the door and entered with her eyes looking at the ground, then she sat on her knees. "Forgive me", she whispered. "I did not want it to happen that way, I shouldn't have let that human see me... My intuition failed me and I even cannot explain why." "Stand up" He said with a tender voice. Aldorniya rose on her feet and saw His divinely handsome face in the big mirrors. He was crying. "The vampire-angels are My dearest children. Fallen angels they might be, but fallen not because of a committed sin as those deluded people believe, but because they serve to their God with the most difficult and responsible of all tasks. Common angels give life. Vampire-angels take life for the sake of God. Common vampires take life for their own sake. Half an angel, half a vampire, that's what you are. All angels are divine, though, and in this vocation there could be no mistakes, Aldorniya, you know it." "What will be my punishment?" she asked with a hollow voice. "You will be banished from the Divine land forever. You will lose your immortality and you will live on Earth as a human. You will feel like humans feel and one day you will die as one. 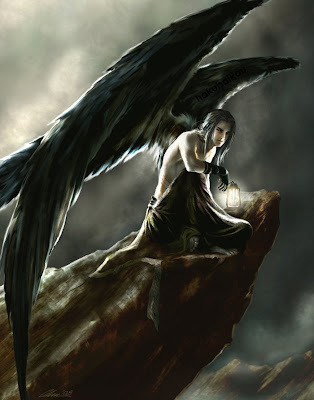 On the next new moon you will have wings no more, and your great strength will disappear. I love you, Aldorniya, and I really wish your destiny were different. But the only right way is the way of justice." She stood silent and was trembling from the feeling of endless loss and the fear of her unknown future. If she could cry too, she would do it now. "And what is going to happen to Avon?" she suddenly remembered the frightened man who was probably still waiting for her in the garden. "Your human is receiving his own punishment right now and there is nothing you can do about it. It's too late." With the time passing, Avon realized that the garden surrounding the castle is actually a vast deserted graveyard. The ravens, which were squawking in such a sinister way, were now so silent. Even Eamon had disappeared. Aldorniya didn't come back either. He was feeling almost utterly abandoned when he heard a quiet voice, nearly a whisper behind the iron bars of the fence. He turned around and he could distinguish the figure of a little boy in the mist. The child was so small, dressed in white clothes, and was holding some bones in his hands. After he came closer, he saw that those bones were in fact the skeleton of a puppy. "What are you doing there all by yourself, little one?" Avon asked, totally confused. "I am lost", the boy answered. "Will you open the gate so I could come in? I'm freezing... It's so cold... I want to go home, in the castle." "I don't know if I should do that", he said with a voice full of uncertainty as he remembered Aldorniya's warnings. The little boy, however, was sitting on the cold rocky ground, hugging the small puppy skeleton, and looking at Avon in such a heart-breaking way that he decided to help in spite of everything. He started climbing the fence and was just passing over the other side of it when Eamon showed up. "What are you doing you fool!" he attacked him angrily. "Don't go outside!" "But it's just a little boy..."
But it was too late. Avon had passed the fence and as it was too high so he fell on the ground and hurt himself while he was jumping down. The little boy's lips curved into a wicked smile. "I saw you coming with her here...", the voice of a demon, Avon thought, but he couldn't realize the meaning of the words he was hearing. "I saw you coming with Aldorniya! Now you're going to die but I will give you life after death... an immortal life... I want just one thing in return from you. Kill Aldorniya! Kill my mother! Kill her... Kill her..."
The boy bit his own wrist and then let the blood dropping on Avon's lips. And the magic began. Never had in his life Avon felt anything like that, as if the essence of life itself was contained in that liquid, and it gave him great strength, much, much, much bigger than the one he had lost a few moments ago. He couldn't stop drinking, he was holding firmly the little tiny wrist of the boy towards his lips and drinking again and again... That's how Aldorniya found him. "Avon!" she shouted and her voice interrupted his dark ecstasy. The boy got free and ran away in the darkness, leaving him alone. Avon rose, licking the blood from his lips and looking around. It was just now that he realized the true beauty of that place - the graveyard with its ruinous gravestones, the big sad willow trees, the odd black flowers growing nearby which the wind was swinging gently; and the night, with its numerous shiny stars, with its majesty. Had he really been so blind for the miracles of the night all these years? "I am home!" he said, with his arms raised towards the sky and a wide smile on his face. Aldorniya fixed her cold eyes on him. He was already getting used to her typical unfathomable stare. "No, you are not" she shook her head. "Vampires have no place at God's castle." "Is that what I am now? A vampire?" he sounded so content. "Who would believe it, I am immortal!" "In your case it's a curse, not a blessing" she clenched her teeth, slightly irritated. Maybe human emotions were already slowly sneaking in her soul. "But I believe you will have enough time to come to the same conclusion in the future. Now I have to bring you back somewhere near the place I took you from. The new moon starts soon and when it is over, I will lose my wings and my powers. Therefore, we don't have much time. You are coming with me. Don't forget that I am still much stronger than you..."
© Copyright 2019 Faylinn. All rights reserved.